The Daily Coyote » Blog Archive » Lamb Chomp! How doth ye DO it? Your captions are so great. Hilarious & humbling. Fantastic & fantastical. I dream of a world where lambs and squirrels can live as one…I mean, really live as one. Squirrelambs, if you will. Heads or Tails, it’s still MINE! Ewe make the hair on the back of my neck stand up. • • • This is Charlie immediately after getting a new toy. Which became his favorite toy. Can’t wait to see what you do with this picture. Leave your title, caption, or thought-bubble in the comment section of this post and you’ll be in the running to WIN! This week’s prize is a signed copy of my book ~ your choice of hardback, paperback, or gluten-free cookbook! U wouldn’t take my sheep, would U? Off on a hair raising adventure. So hurry up with the camera already! Don’t Even Think About It!!!!!!!!! I wouldn’t if I were you! That is one strange looking stuffed animal….1/2 sheep, 1/2 what??? But you know Charlie didn’t care – it was prey and he loved it…. Keeping the world safe from stuffed animals. Boomerang lambie you came back! A predator that makes the hair on the back of his OWN neck stand up. Is this what got Mom and Dad in trouble? I can’t help it, its in my blood. This doesn’t taste like Elk. I’m no fool, it was never alive. 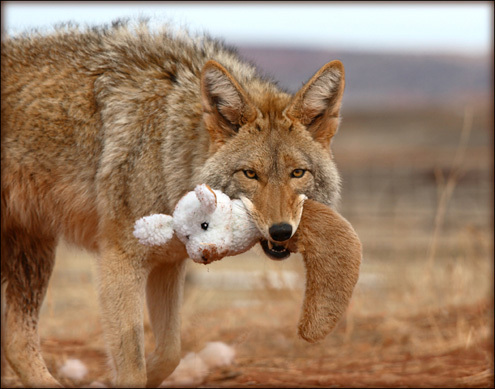 Charl E. Coyote finally catches his prey. Behold! The triumphant hunter returns! Fluff and plush in the plains. Ewe’re my one and only. Boomerang baa is caught again. Not Quite An Elk/Elf Leg, But It’ll Do. The Big Bad Coyote Finally Blew Down The Brick House. Ruthlessly culling the unfit plushies. In like a lamb, out like a coyote! I don’t know what it is, but I sense this is the beginning of something wonderful. I’ve got the world by the tail!!! The stuff(ed) dreams are made of. I’m planning on serving it with fava beans and a nice Chianti. “i won’t hurt the squirrel…. Toy! Toy! I Got A New Toy! Shreve’s the Best, I Got a New Toy!!! It was the last anyone saw of the elusive Lamberang…. This doesn’t concern you, just look away. Why yes, thank you, a glass of wine would be wonderful with this. Don’t move or the squirrel gets it! Try it and you’ll draw back a nub. There’s a million gallons of oil spewing into the Gulf every day and you expect me to be happy about a new toy? What?…I’m just taking out the sick, the weak and the plush. The tale of a toy tail. “If you call a tail a leg, how many legs has a dog? Five? No, calling a tail a leg don’t make it a leg. You got this at the “factory seconds” outlet, didn’t you? Yeah, it’s great! I love it! What IS it??? Pray (prey) tell me ~ what shall I do with this ? Don’t even think of taking sh**p from me! I’m makin’ Chloe think I’ve only got 1 new toy, but it’s really 2. I’ve just swallowed half of each! Charlie Had a Little Lamb…. I don’t care what it is, it’s mine! (All of these are so great!!! This is mine, ewe don’t want it. “Lamb Chop” never looked or tasted this good! Who’s Shari Lewis? Charlie’s finding his boomerang doesn’t come back to him nearly as reliably now that Chloe’s all grown up-He doesn’t want to let it go. Please play nice, Mr. Coyote. OK I promise to look after it, what happened to the other one was an accident! Charlie needs to call his Predators Anonymous sponsor…. I couldn’t help it, it the wild coming out inme.
. . . wherein Lamb Chop learns that the song has, indeed, ended. i’m going to love it and squeeze it and tear it to shreds. You mind telling me just WHAT THE HECK THIS IS SUPPOSED TO BE? our competitive rates put down a guide that is below are. Hello, after reading this awesome article i am too glad to share my know-how here with colleagues. African American youngsters, which differed from those of white youngsters. oil or cooking fat of your alternative and warmth.